Pata Yamaha Official WorldSBK Team’s Michael van der Mark wrote history by taking his maiden victory on Saturday at Round 6 of the 2018 Motul FIM Superbike World Championship at Donington Park, and the flying Dutchman produced an encore performance on Sunday by pulling off a simply incredible ride from ninth on the grid in Race 2 to “do the double” and claim his second race win of the weekend. His teammate Alex Lowes rode an aggressive first lap from pole position and led for the majority of the race, before battling hard to secure his second fourth-placed finish of the weekend. Wildcard Niccolò Canepa has not had the easiest of weekends, as the team’s official Test Rider struggled to find a good rhythm, but despite this, he charged from 24th on the grid to cross the line in 18th place. 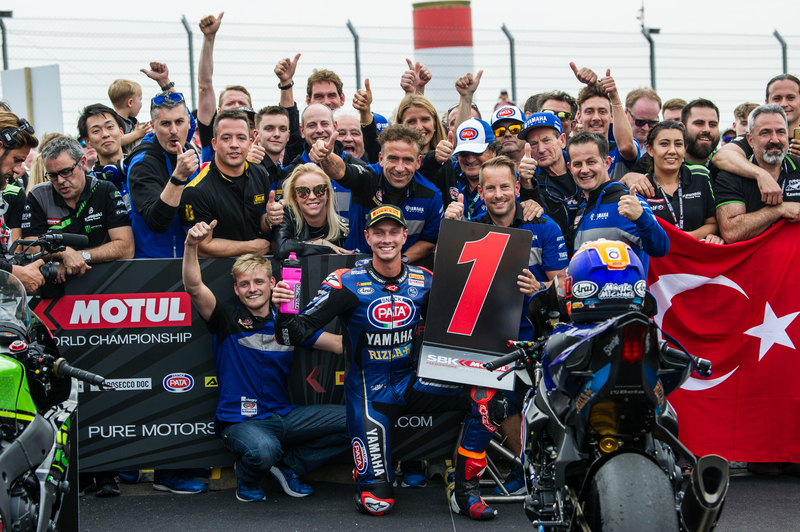 Van der Mark’s historic Race 1 victory saw him become the first Dutch rider to win a WorldSBK race and meant he recorded the first win for Yamaha since their return to WorldSBK in 2016, but it also meant he would start Sunday’s Race 2 from ninth on the grid. A track temperature of 37°C, cloudy skies, and some drops of rain was the order of the day at Donington Park on Sunday and when the lights went out the 25-year-old remained calm and skilfully picked his way past a number of riders amidst a chaotic first few laps. Up to fifth at the end of the first lap, he was showing superb pace and consistency and had fought his way to third by lap 2. He kept on pushing on his Pata Yamaha R1 and by the fourth lap he was into second place and had set his sights on closing down the 1.5s gap to his teammate Lowes in the lead. Staying patient, the 2014 WorldSSP Champion’s pace continued to improve as the race went on and by lap 9 he was right on his teammate’s back wheel. The fight for victory became a three-way battle as Jonathan Rea joined the two Pata Yamaha R1s and, in one of the most sensational races seen in WorldSBK for a while, an incredible game of cat and mouse ensued over the next few laps. Rea made his move on lap 12 for second place but van der Mark just took stock and bided his time, knowing that his pace was good enough to fight for victory in the latter stages. On lap 18, he blasted past Rea and Lowes to take the lead for the first time and with a clear track in front of him, he never looked back, setting his fastest lap of the race on lap 21 and opening up a gap over his rivals. Continuing to push right until the line, he went on to record his second WorldSBK victory by 2.328s, less than 24 hours after the first. In the process, he secured a historic Donington double and the 50 points he collected this weekend now sees van der Mark move up to third in the championship standings with 163 points, just 18 behind Chaz Davies in second. Lowes was determined to fight for victory at his and the team’s home round from pole position in Race 2 after his superb ride to fourth on Saturday. Not getting the best of starts, the 27-year-old Brit was forced wide at the first corner and dropped down to fifth. Mounting a sensational recovery, he was up to second by the end of the first lap and had taken the lead on lap 2. He rode superbly in the tricky conditions as drops of rain appeared in every sector, opening up a gap to the rest of the field and leading across the line for 15 laps. He pushed to the absolute limit, despite struggling with his grip levels on corner exit as the race progressed, only relinquishing his lead on Lap 17 after a stunning duel with Rea. Losing out to his teammate on the next lap, Lowes regrouped and continued to give it his all, battling hard with Razgatlioglu and Rea in the last few laps before crossing the line in fourth-place, just 2.894s behind his teammate to match his result from Race1. Having collected 26 points over the course of his home round, Lowes is seventh in the championship standings with 118 points and is confident that he can challenge for victory once again at Brno after a positive test at the circuit. Wildcard Canepa did not have the easiest of weekends in the UK, as the Pata Yamaha official Test Rider evaluated some new components on his development R1, struggling to find his usual good feeling with the bike. After finishing Race 1 in 20th, he lined up in 24th on the grid on Sunday and despite some excellent work by his team, during the race, he did still not have the feeling he was expecting with his R1. Despite this, he fought valiantly and went on a charge towards the end of the race, overtaking a number of riders to secure 18th place at the chequered flag. Fresh from a historic Donington double, the Pata Yamaha Official WorldSBK Team head to Brno for Round 7 of the 2018 WorldSBK Championship on the 8th-10th of June looking to repeat their success following an extremely positive two-day test at the circuit recently. “An incredible result for Michael, for Yamaha, for the team, and for everyone involved in the project. Yesterday, the way in which the victory was achieved was outstanding and today was even more impressive. As soon as Michael had a clear track in front of him, he was on another level to his competitors. The feeling is less emotional and more one of relief to win, but also honestly of surprise at the way in which Michael was able to dominate. Massive congratulations to him, to his crew, and to all involved. Alex rode an outstanding race as well, leading for 15 laps and making superb passes early in the race to recover from fifth to first. There are a couple of areas of the bike that doesn’t allow him to ride it as naturally as Michael but to fight so hard for the podium and to come in fourth, less than 3 seconds off the win is another step forward and in Brno I expect that progress from Alex and his team to continue. His sportsmanship and teamwork at Donington was also fantastic – when Alex wins, it will also be fully deserved.